In an era when the finest "violins" are fetching millions of dollars, you might wonder if such objects ever reach the hands of violinists who are not millionaires. 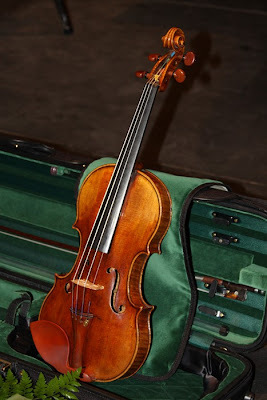 I was able to snap a few quick photographs of the "Amati Violin" after the performance for painting reference. It seemed the perfect inspiration I needed for my "musical themed paintings" I am working on for my next "Celebration of Fine Art" show. I could hardly wait to return home to my studio to begin a series of paintings. The top image is just the beginning stage of the piece. I had already painted my background of my canvas in oil and allowed it to dry. My next step was to lay out the sketch for the beginning stages of the paintings. I will post more of the "in-progress" images over the next few days. This "violin" was made in 1620 and bears the original "Antonio and Hieronymus Amati" label. It has four certificates including one by Daniel Draley putting it as the work, almost entirely, as that of Nicolo Amati. It is an important instrument of historical significance. Andreas Amati was the earliest maker of violins whose instruments still survive today. 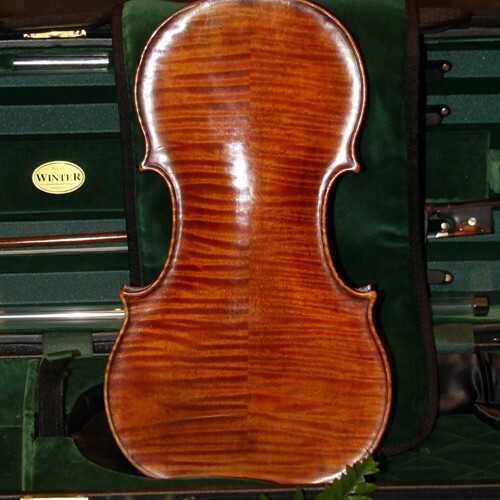 He is credited for giving the modern violin family instruments their definitive profile. His two sons Antonio and Girolamo (aka Hieronymus) "The Brothers Amati", as they were known, implemented far-reaching innovations in design. Nicolo Amati entered the shop around 1620 at the age of only 14. He was most likely doing the bulk of the work by the 1620's but the label on the violins from that period still reads "The Brothers Amati." Famine and plague swept through Cremona in the 1630's. In this city of violin makers, Nicolo was the only violin maker who survived. This historic twist is that not only was he the only one to survive, but he is considered to be the best craftsman of all the violin makers in this family. This shop flourished for its violin production but it also produced some of the most promising violin apprentices of all time, including Andrea Guarneri, Francesco Ruggieri, and a young Antonio Stradivari. 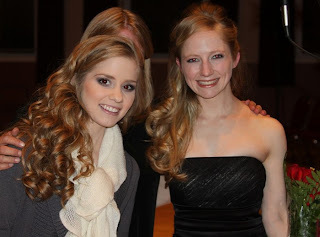 The Beautiful Kristen Tourville (on the right) and her lovely sister Emily. She received her Bachelor of Music from Vanderbilt University in 2005 as a student of Dr. Carolyn Huebl. While pursuing her classical studies as well as traditional fiddling techniques, she was a member of both the Vanderbilt symphony and various quartets as well as the founder of Vanderbillies, a bluegrass fiddling trio. She performed for various functions on the Nashville music scene including playing on the Grand Ole Opry with Ray Price, Merle Haggard, Willie Nelson and Asleep at the Wheel. Kristen's dream is to impart some of the beautiful teaching moments upon the next generation of musicians. If you would like to leave a comment, just click on the comment link...thank you. A preview of a past "Celebration of Fine Art"
Great work Barbara, looking forward to view the balance of you're efforts on this project.